… our friends at Flowing Data offer an expanded version of their earlier graphic survey of well-known movie lines [c.f., Diagramming (Famous) Sentences]. Click here for (a larger version of) the chart from which the image above is a small excerpt. As we aspire to speak aphoristically, we might recall that it was on this date in 1980 that the public learned of the FBI operation known as ABSCAM. Born in 1978 as a sting operation aimed at forgery and stolen art, it shifted to focus on public corruption; aided by a convicted con-man, the FBI videotaped politicians as they were offered bribes by a fictional Middle Eastern sheik in return for political favors. The investigation ultimately led to the conviction of a United States Senator, six members of the United States House of Representatives, one member of the New Jersey State Senate, members of the Philadelphia City Council, the Mayor of Camden, New Jersey, and an inspector for the United States Immigration and Naturalization Service. And of course, it provided the inspiration for American Hustle. 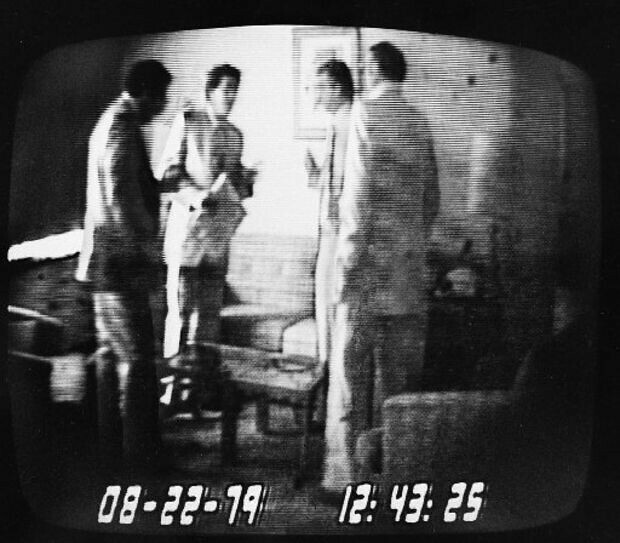 A videotape played at the first Abscam trial on Oct. 14, 1980, showing Pennsylvania Congressman Michael “Ozzie” Myers accepting an envelope containing $50,000 from undercover FBI agent Anthony Amoroso. Looking on is Camden Mayor Angelo Errichetti and con man Mel Weinberg.